Sparks fly when lawman Jake Langford takes over Maddie Boone’s homestead to trap an escaped killer. 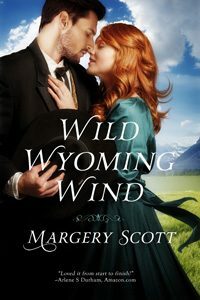 Fiercely independent since the death of her abusive husband, Maddie wants nothing more than to be left alone to build a new life in the Wyoming wilderness. But living in close quarters with Jake exposes emotions far more threatening than the killer watching them, forcing her to question the past, and eventually, to trust in the future. Â Â Â Â Â “Get off my land!” Maddie Boone’s finger trembled on the trigger of the Winchester in her hand, but she held the barrel steady. Â Â Â Â Â The stranger drew his roan-colored stallion to a halt. Leaning on the pommel of his saddle, he met her gaze. His horse whinnied and shuffled, raising a cloud of dust in the drought-ridden yard. Â Â Â Â Â “Are you Mrs. Boone?” he asked. Â Â Â Â Â She didn’t answer. If the man didn’t know who she was, she saw no reason to tell him. Â Â Â Â Â Maddie hoped the stranger didn’t hear the nervous trill in her voice. She’d never actually shot a man, but there was a first time for everything. She’d had a lot of ‘first times’ in the past few weeks, and no doubt she’d have many more before she was finished. To show she meant business, she raised the sight of the rifle to her eye and clicked the hammer back with her thumb. Â Â Â Â Â “When will he be back?” the stranger asked, as if he wasn’t the least bit worried about the possibility of being shot, even though she did notice he was sitting a little straighter in the saddle. Â Â Â Â Â He didn’t leave. Didn’t even budge. Instead, he just sat there, watching her. Then he leaned forward and rested his hands on the saddle horn as if he was having a pleasant conversation with a friend instead of facing an armed woman with a shaky trigger finger. Â Â Â Â Â “My sympathies,” Jake said softly. Â Â Â Â Â “It’s done and over with,” she murmured, as much to herself as to the marshal. Â Â Â Â Â Maddie didn’t answer for a few moments, considering the consequences if she allowed him to set foot on her land. Marshal or not, he was still a man, and she was a woman with no husband to protect her. The last time she’d relented and allowed a man – one of her neighbors, no less – to dismount, she’d ended up having to chase him off with a pitchfork. Â Â Â Â Â Maddie noticed the slight movement of his hand towards his open jacket, and her heart began to thump. Was he reaching for a gun? Â Â Â Â Â The badge pinned to his flannel shirt glistened in the afternoon sun. Â Â Â Â Â As he moved, Maddie noticed he had a slight limp, and wondered if he was injured. She wasn’t about to ask, though. She didn’t care anyway. It could be a trick to make her let down her guard. One of Caleb’s friends had tried that, too, the day she’d buried Caleb. She might not have much education, but when it came to common sense, she had more than her share. Â Â Â Â Â She squinted as the setting sun moved behind his shoulder, putting his face into shadow. As if he sensed her unease at not being able to see him clearly, he took off his stained brown Stetson and ran his jacket sleeve across his forehead. Â Â Â Â Â He really was a remarkable looking man. Square-jawed, with a hint of a cleft in his chin, tanned skin, and golden highlights in dusty brown hair just a shade too long to be respectable. But it was his eyes that trapped Maddie’s attention. Hazel with tiny flecks of gold that seemed to sparkle in the sunshine, framed by long dark lashes. Â Â Â Â Â Their eyes met, and he smiled. Â Â Â Â Â For no reason, her heart began to flutter with the speed of a hummingbird’s wings. Stop it! Maddie admonished herself. Didn’t you learn anything from Caleb? Just because a man is nice to look at on the outside doesn’t mean he’s the same on the inside. If nothing else, you found that out the hard way. Don’t go making the same mistakes again, taking men at face value. They turn on the charm when it suits, and then when it’s too late, you find out what they’re really like. Â Â Â Â Â Maddie didn’t know anything about the robbery at the bank in Eagle Creek other than what Caleb had told her. And he certainly hadn’t told her he’d been part of it. Caleb had forbidden her to go into town after the robbery. She’d wondered why at the time, but she knew better than to question him. Because she’d been isolated, she didn’t know anything other than that Tyler had been arrested and sent to prison. Â Â Â Â Â “There’s no money here, and Caleb couldn’t have had anything to do with that robbery.” Why she was defending him, she couldn’t say. It just seemed as if she she should. Â Â Â Â Â Good question. Â Â Â Â Â “No. I swear I had no idea.” She searched the marshal’s face for a sign that he believed her. For some unfathomable reason, it was important to her that he did. Â Â Â Â Â “Seems to me a wife would know what her husband is doing when he’s not home,” the marshal said. Â Â Â Â Â Caleb hadn’t told her much of anything after the first few weeks of their marriage, and if she was being honest, she didn’t want to know. Â Â Â Â Â Maddie’s thoughts strayed from the stranger to Tyler Boone, the man Caleb had introduced her to at their wedding. Tyler was even more handsome than Caleb had been, dark-haired and with a tongue smooth enough to send the hearts of half the women in town aflutter. At first, she’d even been taken in by his flattery and attention. Then, she’d learned different, just as she had learned her husband wasn’t the kind, gentle man she’d fallen in love with in Denver. Â Â Â Â Â Later, when she’d heard about the robbery at the bank, and Tyler’s arrest for the murder of three people, one of them a little boy, she’d been horrified. Â Â Â Â Â He was right. The muscles in Maddie’s arms were aching from the weight of the rifle, but did she dare let down her guard? Â Â Â Â Â For several long moments, she considered his request. Could she trust him? His steady gaze made the decision for her. He didn’t seem the least bit jumpy, she reasoned, and that was usually a good sign. Â Â Â Â Â Finally, she lowered the rifle and leaned it against the side railing of the porch. She stood aside to allow him to step onto the porch and sit down in a rocker near the rose bush she’d planted when Caleb had first brought her to Wyoming. The fragrance rose to meet her nose, and she breathed deeply, wishing she had more time to sit on the porch and enjoy the scenery. But she didn’t, so there was no use pining for something she couldn’t have. Â Â Â Â Â She turned her attention back to the marshal. His presence seemed to fill the small porch, and as he settled in the rocking chair, Maddie couldn’t help but notice his long legs stretched out in front of him. Long legs with strong, muscular thighs. She felt her face flame with embarrassment. Heavens, what kind of lady noticed things like that? Â Â Â Â Â Perhaps Tyler had heard of Caleb’s death, and would keep on moving. Once she’d realized the type of man Tyler was, she’d always felt a little uncomfortable around him, and she’d be quite happy if she never saw him again. Â Â Â Â Â What? She couldn’t have heard right? “You can’t stay here,” she said, her voice rising a notch. Â Â Â Â Â “You assume he’s headed back here, but you have no proof,” Maddie insisted. Â Â Â Â Â “What? That’s ridiculous,” Maddie gushed. “Caleb is dead, and he never mentioned money to me, so what danger could I possibly be in?” she asked, faking a bravado she didn’t feel. Â Â Â Â Â “I see,” he said thoughtfully. Â Â Â Â Â The marshal raised his hand. “Tyler Boone doesn’t know that. He won’t believe you. If you don’t give it to him, he’ll probably decide to kill you instead. And since he hasn’t had a woman in the last two years …” His voice trailed off. It wasn’t necessary to finish the thought. Â Â Â Â Â His gaze swept over her much the way Caleb’s had done when he’d first courted her. “That’d be a real waste.” Again, her heart did its little dance, and suddenly, it seemed as if all the air had been sucked out of her lungs. Heavens, what was wrong with her? Â Â Â Â Â Maddie supposed his reasoning was sound, although she hated to admit it. Â Â Â Â Â If nothing else, she’d made one decision since Caleb died. Never again would a man tell her what to do. Whether she was right or wrong, she would make her own decisions. “That’s where you’re wrong, Marshal. I’m not leaving.” She glared at him, daring him to argue further. He leaned forward, trapping her gaze with his. Gold flecks twinkled out of his hazel eyes, and he was close enough that she noticed a small chip out of one of his teeth, the only flaw in an otherwise perfectly white set. And lips that she sensed would be both gentle and demanding all at the same time. She couldn’t keep her eyes off them. Â Â Â Â Â The marshal turned away from her and looked out, and Maddie followed the direction of his gaze. Then she turned her attention back to him, noticing his brow crease in a frown. Surely she’d finally made her point. Â Â Â Â Â His gaze swept the yard, and for a moment she was a little embarrassed at the disrepair of the homestead. The chicken coop needed fixing, the barn roof leaked like a sieve, and the paint on the front porch had peeled off in places, leaving the bare wood to the mercy of the Wyoming climate. One of the porch stairs was cracked, and if she wasn’t careful where she stepped, one of these days she’d fall right through and probably break her leg. Â Â Â Â Â “No.” He stood up then and moved towards her. Her heart began to pound. Why she would react this way, she didn’t know, but she didn’t like the feeling one bit. Â Â Â Â Â She couldn’t shoot a man. Lord knows she’d had reasons to in the past, but even then, she couldn’t bring herself to take a life. Damn him if he hadn’t seen right through her bold talk and recognized just what a coward she really was. With a final glare at being outmaneuvered, she turned and stomped into the house, giving the door a heavy shove to make sure it slammed behind her.